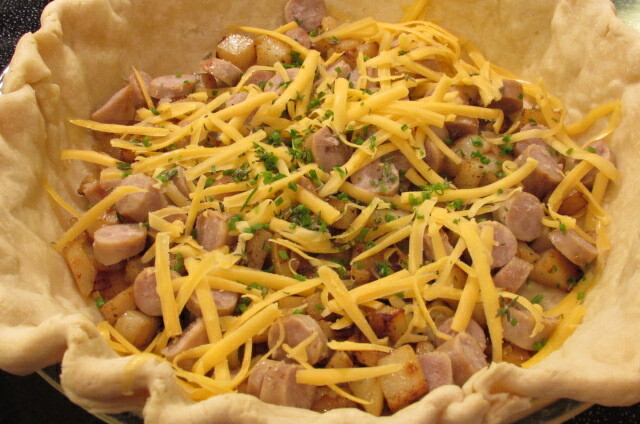 Quiche is a really simple, awesomely versatile “comfort food” dish. 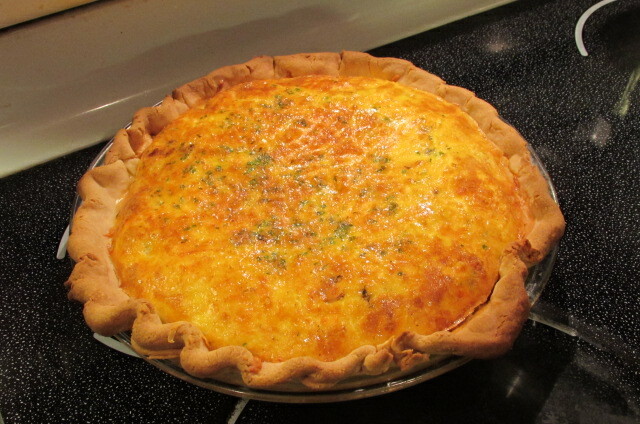 If you can buy a pie crust and crack eggs, you can make Quiche. And, given the gobs of food people generally prepare this time of year, Quiche is also a great way to repurpose leftovers! I had some leftover breakfast sausage and potatoes so voila-breakfast becomes dinner. I also happen to have awesome farm fresh eggs, which makes this classic dish extra special. A big thanks to Josh and his gals at The Hen Pen in Napa for all of the gorgeous eggs. Be sure to also check out our post on farm fresh eggs vs. store-bought eggs. Preheat oven to 425 degrees. Line pie crust with tin foil, weighted down with dried beans or pie weights. Bake 15 minutes. Remove crust from oven and carefully remove tin foil and beans (beans can be saved and reused for this same purpose, however, please do not cook and eat them). Let crust cool a few minutes. Meanwhile, in a large measuring cup or bowl, whisk together egg, milk, salt and pepper until eggs are pale yellow. 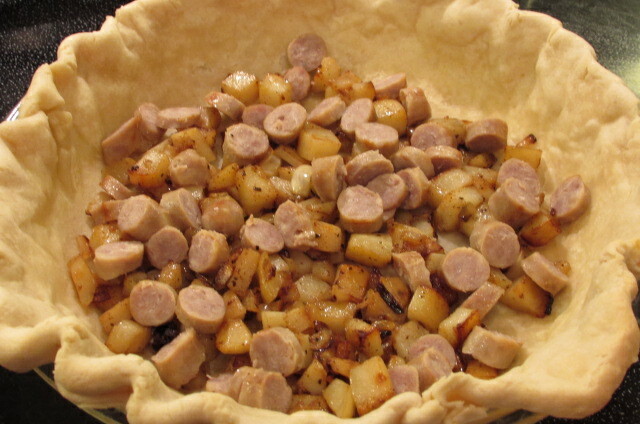 Evenly distribute your breakfast sausage or other meat and potatoes on the bottom of the pie crust. Sprinkle with a thin layer of cheese and sprinkle with 1 tablespoon of chives. 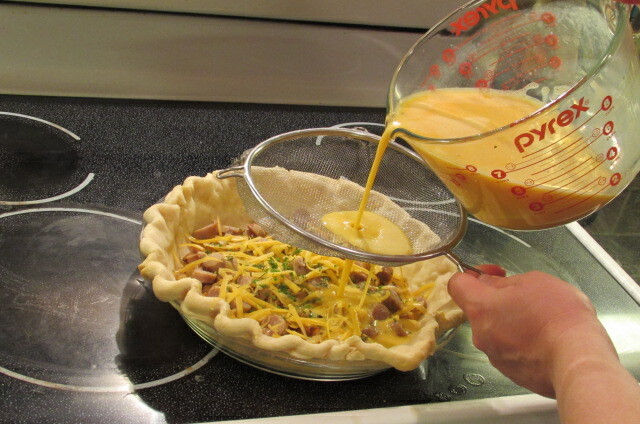 Working with a strainer in one hand, carefully strain the egg mixture through a mesh strainer into the pie crust. Gently tap pan on the counter to let out any extra air bubbles. Top eggs with remaining cheese and chives. 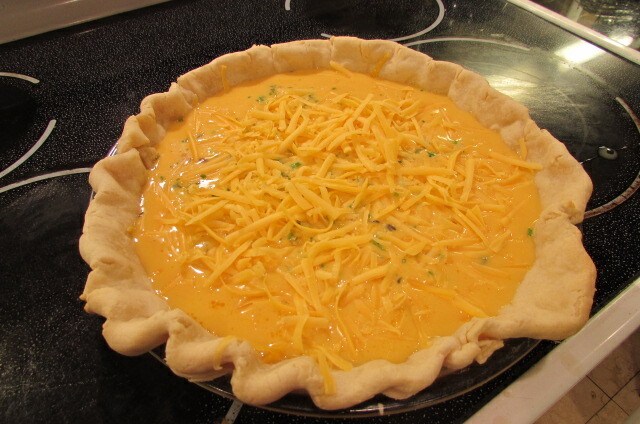 Bake Quiche for around 40 minutes or until a knife inserted into the center comes out clean. Remove from oven, cool and enjoy! Tags: bacon leftovers, breakfast leftover recipes, breakfast quiche, brunch recipe, farm fresh eggs, food, ham leftover recipes, high protein meals, holiday brunch ideas, leftover ideas, potato leftovers, quiche, recipes, sausage leftovers, The Hen Pen in Napa, what to do with lots of eggs, with pictures. Bookmark the permalink.